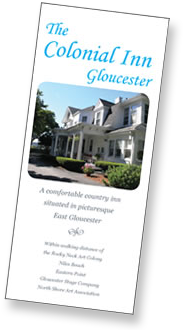 The Colonial Inn was the home of Captain Patch, a Gloucester sea captain. As with most prosperous men of his time, and especially those with a connection to the sea, the home he built was large, ornate and ever looking out towards the ocean. Our guest rooms are not as Captain Patch originally planned…a study, a library, music room, sitting room, servants quarters, and even an elevator room, along with numerous bedrooms…but they still embrace charm, character and comfort for today’s traveler. The guest rooms are light, airy and spacious, capable of accommodating as few as one or as many as five with the area to add more, if that is your need. Lots of possibilities. 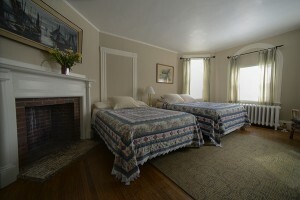 Some of our rooms have two double beds, and some have a queen or king, plus a single. The largest room has a queen, a double and a single bed. Many have harbor views and fireplaces (which are not operational but add to the character). 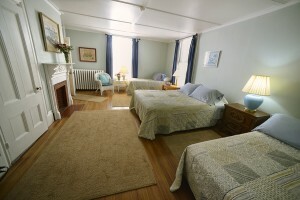 Please contact us to find which room will best suit your needs. 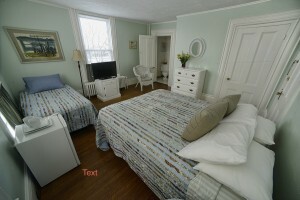 ALL ROOMS HAVE PRIVATE/SEPARATE BATHS. 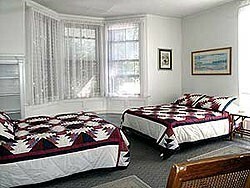 All rooms are equipped with refrigerators, cable television and WiFi for easy wireless internet access. All rooms are non-smoking (if you like you can smoke outside on the grounds).